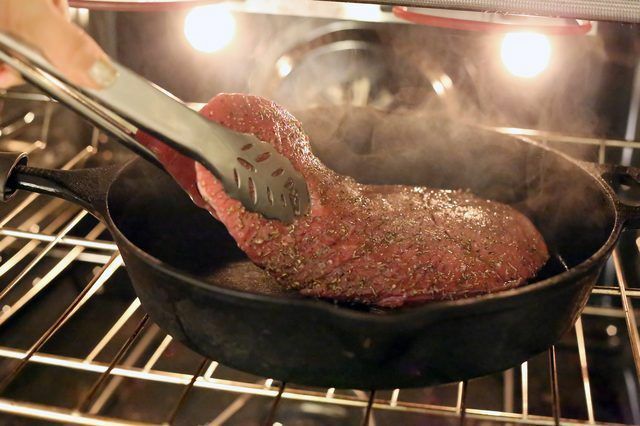 *This recipe creates Medium cooked steak. For medium rare, cook for 10 minutes, flipping halfway through. For medium well, cook for 14 minutes, flipping halfway through. To ensure it is done to your liking, use a quick read thermometer to check the temperature.... Medium Well(150-160F) 1" 4-5 minute, 1 1/4" 6-7 minute, 1 3/4" 8-9 minute Remove steaks from the oven and let rest for 5 minutes. Serving on warm plates is recommended to maintain meat temperature. 16/01/2009�� At 375 most beef steak cuts cook to medium rare (a point) at a rate of 12 minutes/lb less the time for the sear -- call that 3 minutes. At 450, it's around 10 minutes a pound IIRC. Maybe Suzanne will chip in on that. If you're cooking multiple steaks, calculate your time by the weight of the largest one in the pan, not the total weight.... 15/12/2013�� A rare steak cooks to 140 degrees; medium rare to 145, medium to 160, and well done cooks to 170 degrees. Pull your steak when it�s five degrees below the desired temperature and let it rest for 10 minutes to get the perfect degree of doneness. *This recipe creates Medium cooked steak. For medium rare, cook for 10 minutes, flipping halfway through. For medium well, cook for 14 minutes, flipping halfway through. To ensure it is done to your liking, use a quick read thermometer to check the temperature.... *This recipe creates Medium cooked steak. For medium rare, cook for 10 minutes, flipping halfway through. For medium well, cook for 14 minutes, flipping halfway through. To ensure it is done to your liking, use a quick read thermometer to check the temperature. Medium Well(150-160F) 1" 4-5 minute, 1 1/4" 6-7 minute, 1 3/4" 8-9 minute Remove steaks from the oven and let rest for 5 minutes. Serving on warm plates is recommended to maintain meat temperature. 15/12/2013�� A rare steak cooks to 140 degrees; medium rare to 145, medium to 160, and well done cooks to 170 degrees. Pull your steak when it�s five degrees below the desired temperature and let it rest for 10 minutes to get the perfect degree of doneness.